Will Murphy is the vice president for blockchain at of Talla.com, the company behind Botchain, a blockchain for managing autonomous intelligent agents. I predict that in 10 years blockchain technology will improve to a level that calling it “blockchain” will no longer be a useful term. Block: A bunch of transactions bundled together. Chain: The blocks cryptographically connected in a linear fashion. I think in the future the block will not be needed. In its place will be a system where transactions are linked together and can confirm previous transactions. In order to submit your next transaction, you need to validate others in the queue. In order to get what you want (your transaction submitted), you have to do some work for others. Why do it this way? Transaction times in this model would be faster than, for example, bitcoin’s transaction times today. The miner is technically removed and each transaction validates past transactions. Transaction times can actually go down as more people use the system. I also think that in the future, the chain won’t be a single directional string of blocks. I think it will look more like a mesh (or graph). 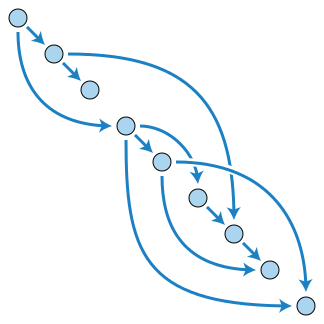 Maybe we could have a non-linear set of of branches that go in several different directions, where many parallel transactions are happening. So, maybe we’ll call it a transaction graph. I’ve also seen the term Tangle (in the IOTA protocol) for early similar concepts. Maybe we’ll call it “the graph” much the same way we speak of “the cloud” today. We will all save information and transactions into this global graph (whether we know it or not). The closest thing I’ve seen so far that matches my imagined path is a directed acyclic graph. What a future “blockchain” will look like. A DAG model works differently than a blockchain. A common blockchain requires miners to maintain blocks, but a DAG wouldn’t need either proof-of-work or blocks. New models of management would be needed. So, there is a lot of work to do. But this model theoretically gets better as new nodes are added. So it may be an improved model for both fees (or, in ethereum parlance, “gas”) and scalability over current blockchain models. In the future, we may have something that does what a blockchain does, only better. There are still challenges to this model, so I don’t know how this will play out. But, I think this design is intriguing, and I’m curious to see how it develops.